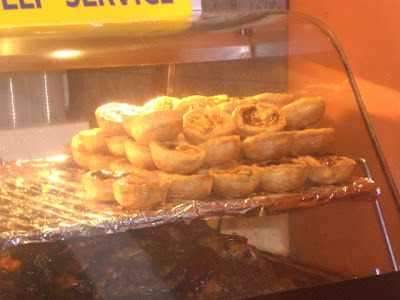 I was in Johor Bahru (JB) yesterday together with my siblings, in search of TexMex Food (will do a post separately) and Portuguese Egg Tarts. 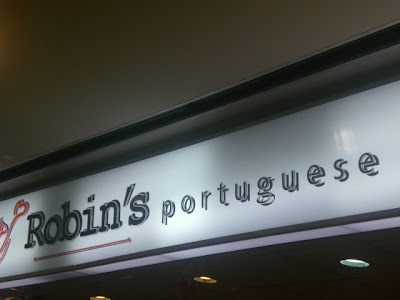 I had seen this foodshop - Robin's Portuguese Chicken - on the 2nd level of City Square before but had never tried eating there before. 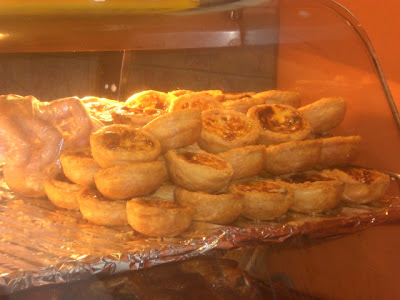 This foodshop also sells Portuguese Egg Tarts. I've tried my hands at making portuguese egg tarts before but with little success with the charred tops. So this time around I thought I might just buy them there. When I reached the place, the staff were replenishing the egg tarts on their display counter. I bought 10 pieces to go but didnt leave right away. We sat down and ate a piece each. They were piping hot, custard was sweet and goes well with the puff pastry. PS. Personally, I think the tarts taste way much better at room temperature! 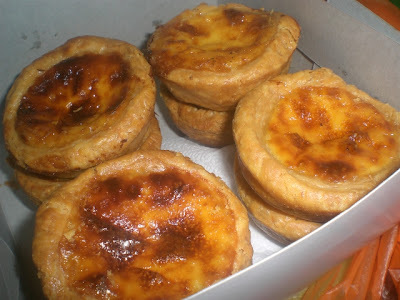 sometime back, maybe 2-3 yrs ago, my mom used to be crazy over these tarts. she'd go to city square and buy up the whole day's stock! teruk tau. she give away boxes to friends, neighbours and family. everyone loves them. the tarts can keep for over a week if well frozen. robin's used to have banana and strawberry slices on each tart...wonder if they still do. really, they used to hv fruit slices on each tart?!?! they've made it back to basics i guess .. no fruit slices when i bought em.